My photos are still trapped on my camera, so I turn again to some recent ones I’ve taken the last few weeks. I’ve ordered a card reader off of that incredibly handy site, eBay, but don’t expect it to arrive until after the long weekend, unfortunately. However, the poor weather has been helpful in limiting the number of photos I’ve taken in the meantime. Today’s archive special is crummy bird photos. I certainly have lots of them. We’ve had lots of birds arriving the last few weeks. My BIGBY list is now up to 50 species, with the most recent addition being a House Sparrow, of all species, showing up at our feeders. It’s pretty unusual to see House Sparrows outside of urban or agricultural habitats, and I’m not sure what it was doing out in the boonies here. Species number 49 was a Northern Cardinal, also a rarity around here, I can count on one hand the number that we’ve seen since we moved in. It was also at the feeders, foraging alongside the House Sparrow. Most of the species have been ones we’ve been expecting, though. 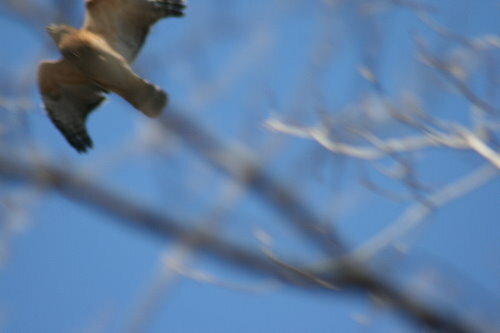 The Red-shouldered Hawks returned a couple of weeks ago, two of them together. Red-shoulders pair up prior to arriving on their breeding territories, and usually hold the same territory from one year to the next, so I think the two that have been hanging out around our house are the same individuals as we saw cruising the area last summer. We think they have a nest in the forest across the road. 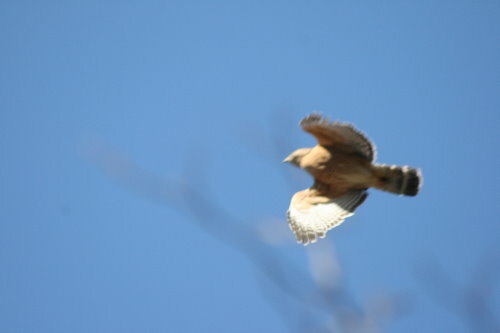 They soar directly over our house fairly frequently, but naturally I rarely have my camera at the ready when they do. The one time I happened to have the camera out, with the long lens on it, the bird came upon me too quickly for me to get the lens focused, though I fired off half a dozen shots anyway hoping one might be okay (none were). I was very excited about the hawks’ return, and was hoping to post something on them, but it might have to wait for later in the summer. Another instance where I was unprepared. I had my 100mm lens on the camera, and didn’t have the 300mm with me. The 100mm is my macro/portrait lens, and I’d been out looking for bugs. I’d decided to leave the extra weight of the 300mm at home. Of course, that happened to be the day that I came across my spring-first Eastern Phoebe, foraging just close enough to be tempting, and just far enough to be out of reach of the shorter lens. 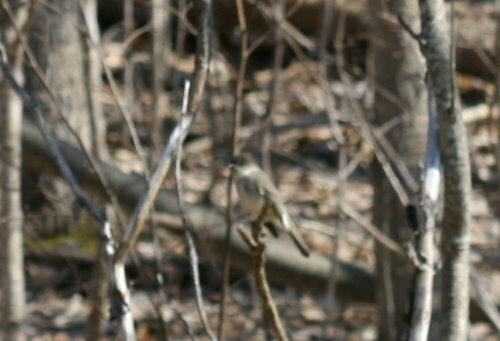 I haven’t had a good photo op of a phoebe since that afternoon. Phoebes are one of my favourite birds, so I’ve been pleased at their return. When we moved in, we noticed an old nest on our security light, and we hoped maybe to see them there again this year since they do sometimes reuse nests, but I think they’ve probably been put off by the dog. 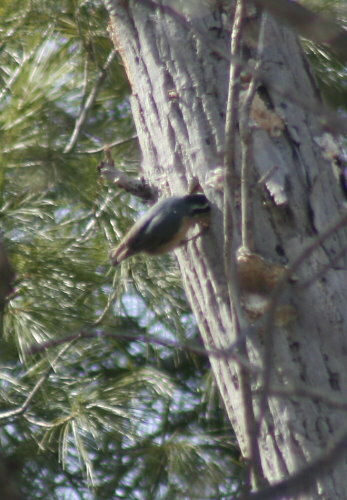 Finally, a Red-breasted Nuthatch, excavating a nesting cavity. 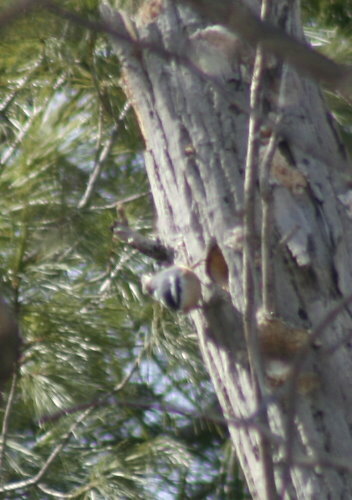 This one I actually had my 300mm for, I just happened to be too far away for a good photo, which was a bit disappointing since how often do you stumble across nuthatches building nests? He was working away up high in a tall dead snag. It looked like it was maybe an inch or two deep, just in the early stages, based on how far he was sticking his head in. This one will be a tougher one to monitor than the Pileated nest, mostly because it’s quite high relative to the size of the bird, but since it’s right along the road I’ll be by it often and can check in now and then. Hey, you can still tell what the birds are:-) I sometimes think images like these are what should be in field guides, because this is how the average person is going to see birds! I took a whole bunch of shots of a pyrrhuloxia last week, but never got a clean look. I must have tried for 15 minutes to coax him out into the open….He was having nothing of it. Keep posting, we’ll keep enjoying. I’m with Eric. While I enjoy beautiful, technically correct photographs of nature, most people will never see anything that comes close to that kind of detail or clarity. The best they can hope for is a blurred bit of color flitting through the canopy or dashing beneath a spot of brush.